Product Description The Advanced 4C3 Multi-Sample Cryoscope uses the preferred freezing-point method to precisely determine the amount of added water in milk. The Advanced 4C3 offers unique continuous throughput for maximum efficiency in large-volume testing. Batch testing is also efficient with the 4C3; samples can be prepared in advance and loaded into sample cassettes. 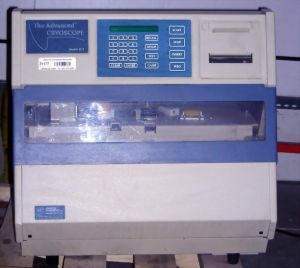 When ready to begin testing, an operator can load up to four sample cassettes (holding up to 40 samples) into the cryoscope, press Start and walk away. The instrument automatically tests each sample in turn and records the results; keeping your cryoscope and operator working at peak efficiency. The 4C3 is microprocessor-controlled for simple, pushbutton operation. Extensive self-diagnostic and troubleshooting prompts keep you up and running.